The steam venting all over the place is really hot. Coming into Beppu on the train from Kokura station, we were all reminded of Liguria (yeah, the one in Italy)–the landscape and seascape, the ports, the seaside little cities were very similar to Rapallo, Santa Margherita Ligure, Chiavari, and of course Sestri Levante (our town). Maybe it was this sense of familiarity, but I found this part of our trip to be the most comfortable so far (despite the fact that there is practically no English spoken in these parts, even by train station and hotel staff). At Beppu station, we stashed our luggage in coin lockers and hopped a bus to Kannawa, which is really an inland suburb of Beppu. 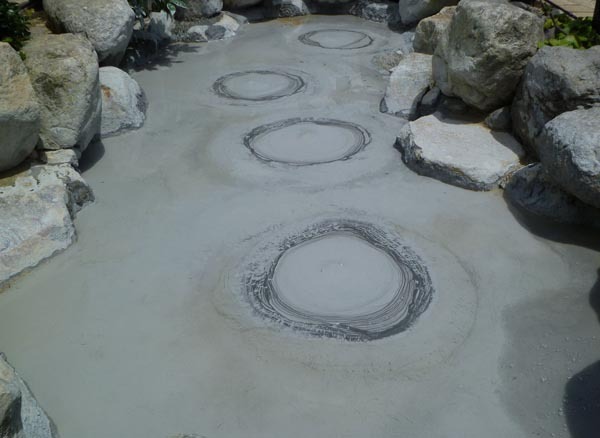 Kannawa is mostly known for its many “hells” or jigoku. 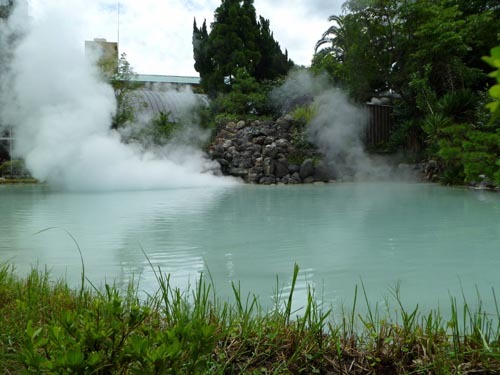 This is an area with intense geothermal activity, and many of the houses here are plumbed to make use of natural steam vents or hot water springs for heating, cooking, and bathing. 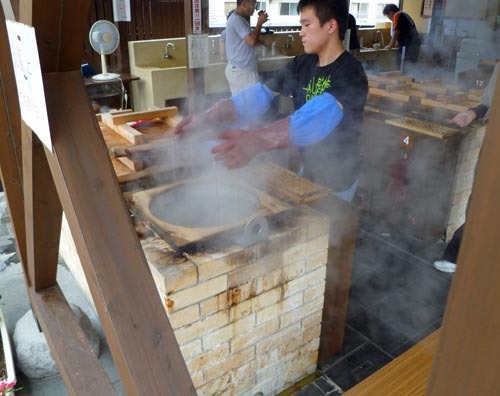 Those who are not lucky enough to have such resources in-house are able to take their food to public steam kitchens and bathe in public onsen. I could sort of envision a similar burg going up in Wyoming at the site of another famously geothermic hotspot. 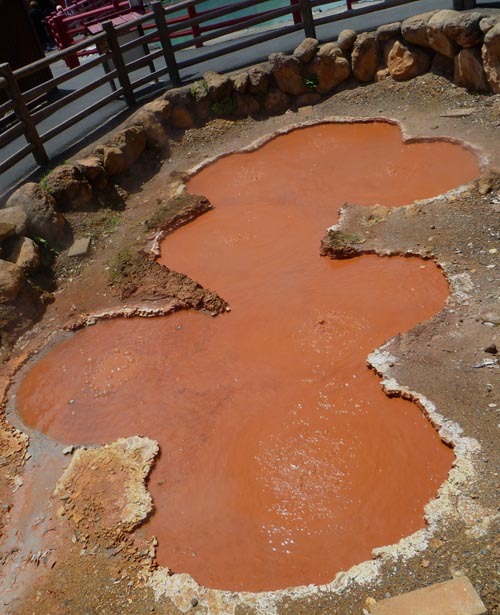 The jigoku are the big tourist attractions of Beppu, and you can visit the hells individually for 550 yen per person, or you can buy a book of tickets for eight hell entries for 2000 yen. Those of us old enough to remember Disneyland ticket books may have a moment of geezer-ish nostalgia at this. Six of the hells are located near the Kannawa bus terminal, and the other two are 2.8 km away, which means another bus ride. There is definitely a carney side-show feel here. The year-round availability of free heat makes it possible to keep tropical plants and exotic animals. For 100 yen you can buy crackers to feed to an ancient-looking African elephant. 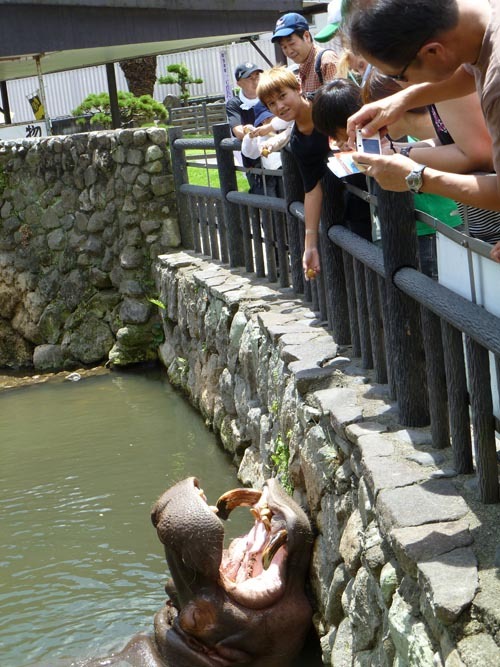 There’s a hippo that comes and opens its mouth for you so that you can drop in potatoes. Eggs cooked in the jigoku were a great bargain--100 yen for two eggs, which tasted just like regular hard-boiled eggs. Water comes out at just the right temp to brew tea (or coffee or mate). 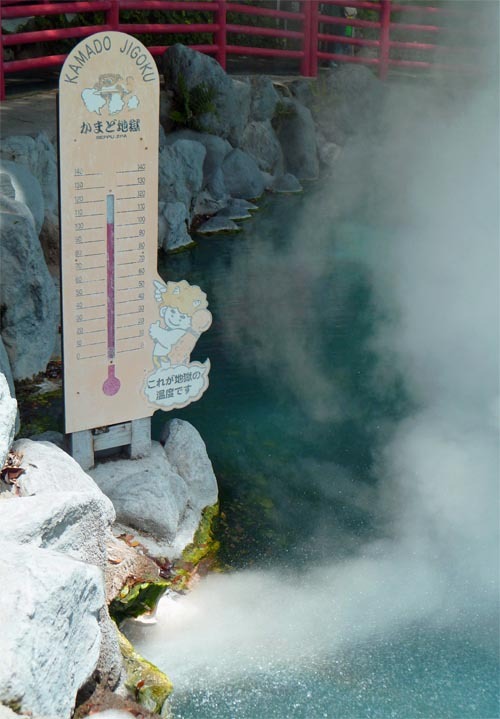 Eggs cooked in the hot water are popular snacks for visitors of the hells, as are buns cooked by the steam, which is venting everywhere. Some of the hells are muddy and gray or red, some clear and azure. Lots of heat, lots of shrines, lots of tourists–though very few westerners, compared with most places that we’d been up to this point. It seems that this area gets a large number of tourists from Korea, as much of the signage is posted bilingually in Japanese and Korean. 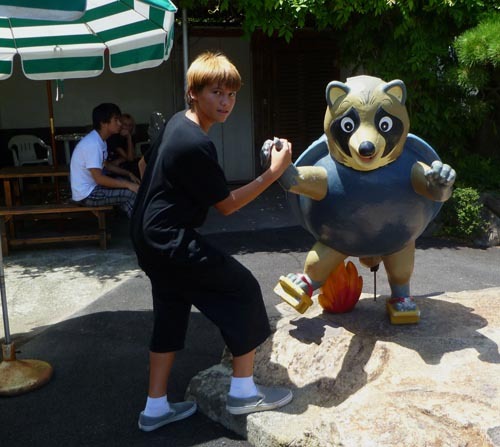 A trip to Kannawa would not be complete without a visit to an onsen, though finding one that would accept “tattoo-guys” required the help of the tourist information office. While in the rest of the world everyone an their grandmothers have tats, here in Japan it’s still something that is associated with organized crime. And apparently no one wants to bathe in the same water as someone who snuffs people out or who would cut off his own finger to demonstrate his toughness. Gangsters are considered bad for business for owners of onsen and sentou, and the easiest way to keep them away was to institute a general ban on body art. Mr. Helpful-Man at the information bureau located the ink-friendly Hyotan spa within walking distance and gave us a coupon for 50 yen off the regular entry price (score!). The routine of shoes off before entering was predictable, except here you carried your shoes inside and stored them in a shoe locker. Then purchase tickets from a machine for spa entry (700 yen), towel (180 for a small, cheap onsen towel you keep or 100 for the rental of a bath towel), and for the yukata (robe) to be worn in the sand bath area, which is the only coed part of the facility (and costing another 200 yen). Tickets and shoe locker key go to attendant (we also got back money for the coupon that we got from Mr. Helpful) and we get back another key for the changing room locker, towels, and yukata. Over in the men’s changing room one strips starkers, and everything except for the towels gets stored in the locker. Some people bring their own toiletries, but this isn’t necessary because shampoo and body wash are provided at each of the washing stations. 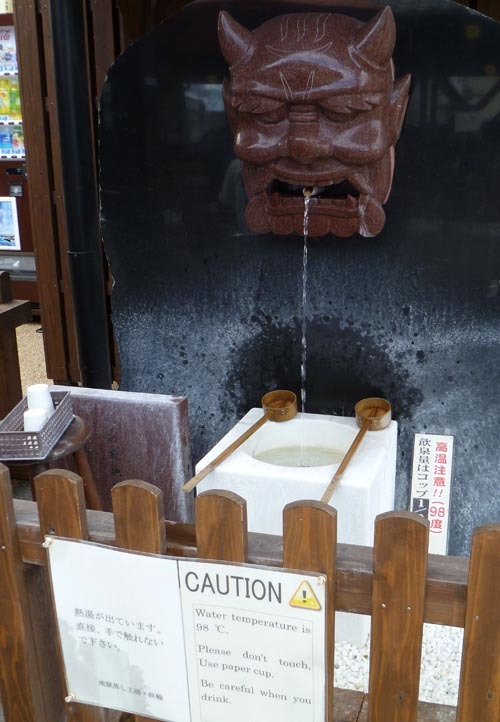 Now the Japanese are adamant about having you perfectly squeaky clean before entering the shared water of the bath–obviously the point of the bath is not about getting clean. 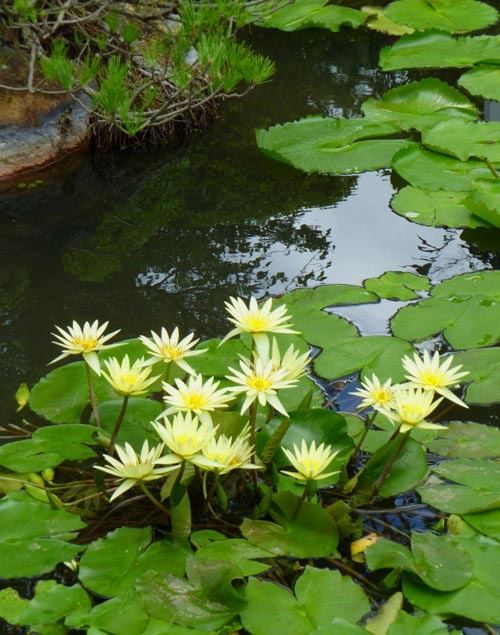 They are also adept at self-washing while seated on a tiny footstool and using a spigot and a small wooden basin for rinsing. For the rest of us, this onsen has graciously provided a hand-shower. 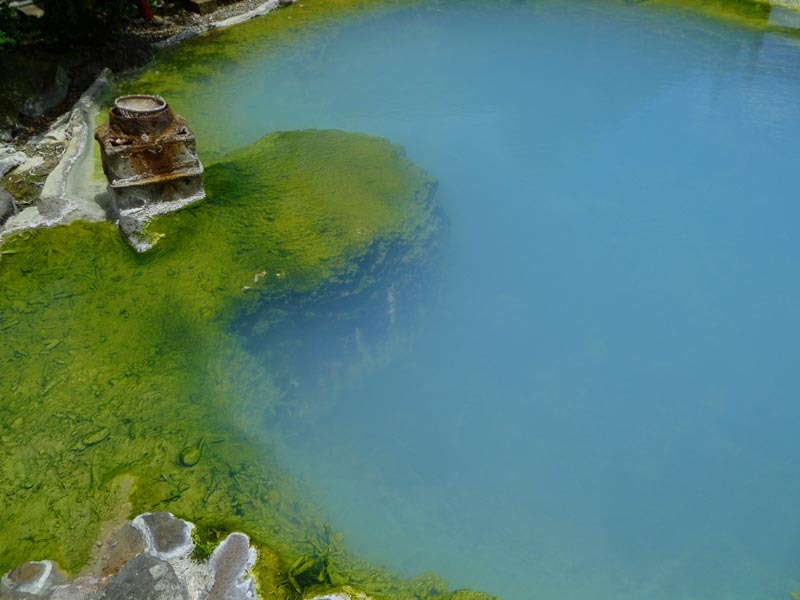 In the men’s bathing area there were six baths: a “pebble bath” which was really a walk-through footbath a couple of inches deep, a rock bath, an outdoor garden bath (it looked like a heated koi pond, except for the naked people), a waterfall bath, a bath lined with wooden panels (like a giant sake cup, with naked people), and the onsen’s signature hyotan bath in the shape of a water gourd. This was also the hottest bath, and after just a few minutes I needed to get out and take a rest on this wooden chaise lounge using a four-by-four as a pillow. This was the best part for me. The sand bath is this gigantic indoor sandbox divided into four sections by concrete footpaths. It’s dry sand, so I suspect it must be using radiant heat from steam-carrying pipes under the sand. The protocol is pretty simple. Rake out a flat depression to lay out in (more four-by-fours provided for headrests), lay self down, cover self with sand. They warn that low-degree burns can occur if you stay for more than twenty minutes. Afterwards, though, you end up with a lot of sand sticking to your skin, so another trip to the washing station and a Hyotan bath took care of that, but then I needed another rest on the chaise lounge. Bathing is hard work. On the way out I felt rather parched, and–goodness forbid–there he was, the beer guy selling frosty mugs of nama-biiru! Another happy moment involving an amber beverage. Moving further away from Japan’s “big two” cities of Tokyo and Kyoto, accessibility to non-Japanese speakers drops away rather quickly. Even in Hiroshima, a city visited annually by a huge number of western tourists, our evening meal in a modest ramen shop near the train station transpired without English menus or English-speaking personnel. The minuscule bit of food-focused Japanese I was able to cram is really becoming important now. There are a lot of really important things I still don’t know how to say, and I can’t understand the directions I’m given very well at all (we are getting lost a lot), but we are eating well. Traveling further south now to the southern island of Kyushu, we are wrapping up our day at Beppu in the nearby city of Oita. The point of our staying in Oita rather than in Beppu was the presumption that being the bigger city and known as a fishing port Oita would have better seafood. Also, I was highly intrigued by the Japan-wide reputation of Oita mackerel (saba) and spanish jack (aji, usually translated as “horse mackerel” here). 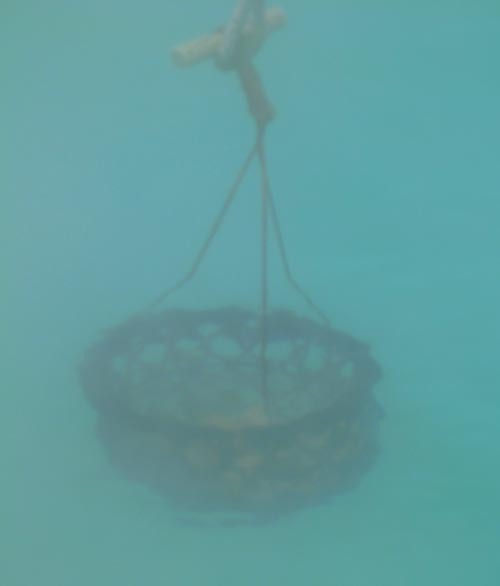 Both of these are common in my end of the Pacific, but neither is highly prized as table fare. I typically think of the spanish jack as a nice bait for bigger fish, while mackerel are just undesirable nuisances. Most Japanese would tell you that the water around Japan is colder, and this makes the fish from here taste better than what we get back home, and around Oita (specifically in the strait between Kyushu and Shikoku) the water is even colder and the currents stronger, making the local fish among the tastiest in Japan. The local fugu are also special, but it’s not the right season now. I guess we were hungry. The food was all gone by the time I remembered that I had my camera along. It was easy to find a place featuring local aji and saba, and it was pricey, just as we were forewarned–about 1500 yen for a small plate of sashimi. 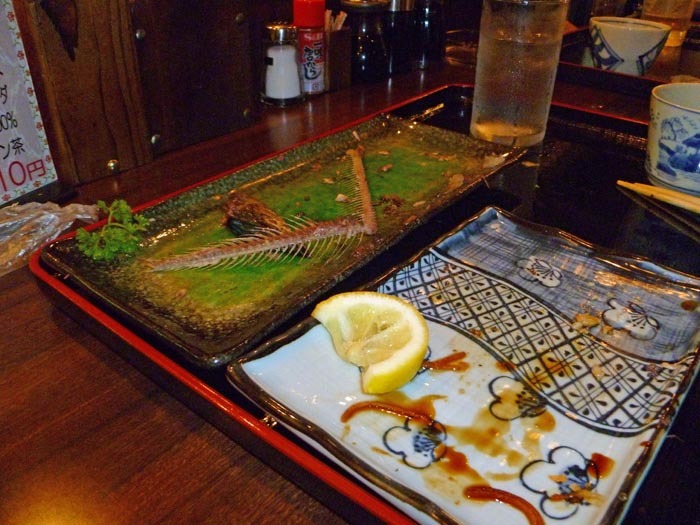 We also had a grilled aji, a grilled sanma, and Sharkey had chicken tempura, another local specialty. The sashimi was excellent. I have actually made sashimi with winter-caught mackerel from back home, and this was very different. The white (fast-twitch) muscle was much lighter–more the color of yellowtail than of mackerel–and the oil content was also much higher. If it weren’t for the skin that was left on, I would have never guessed that this was mackerel. The spanish jack sashimi was also excellent, though only a bit better (lighter in color, oilier) than aji I’ve had elsewhere. For the grilled fish, though, the spanish jack was not special. I think that this method of grilling (shioyaki) enhances the flavor of stronger, darker fish, and the sanma was the better dish here at half the price of the aji.